The vast landscape in the Harvest has been built up in horizontal planes; in the foreground lies the harvested wheat, while in the background the purple-blue mountains rise up into the turquoise air. Van Gogh was not interested in simply painting a pretty, sun-drenched landscape, but in capturing the essence of country life. The various stages of the harvest are depicted in the central plane: there is a haystack, ladders, several carts and, to the right, a man with a pitchfork. Although they appear rather small, Van Gogh considered both the farmers and their labors to be an essential part of his painting. 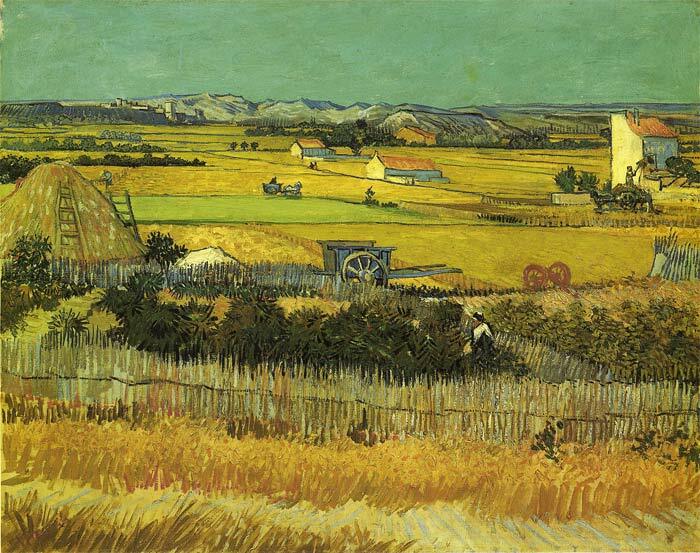 Van Gogh himself gave the painting its title: La Moisson, the harvest. In his early work in Nuenen, too, the artist had sought to illustrate the various facets of peasant life . SPECIAL NOTE : The painter will make the reproduction as close to the original oil painting as possible. If you want your painting to alter from this likeness, please email us and " The Harvest, 1888 " will be reproduced according to your special requirements.